This Hinkley Sabina 5 light chandelier in silver leaf finish with eggshell silk shades features contemporary style and geometric frame. Boasting a circular ribbed ceiling mount, chain suspension and ribbed top gallery, with five swooping arms that form the body and curve outwards. The body features five curved candle holders and outer linked geometric pattern in silver leaf, with candle style lights, metal drips, candle sleeves and eggshell silk cylinder shades. The Sabina features an airy, linked geometric form in a glistening silver leaf finish that infuses a jewellery like sheen to the design. The eggshell silk shade provides an elegant backdrop to the pattern while subtly masking the light bulbs. 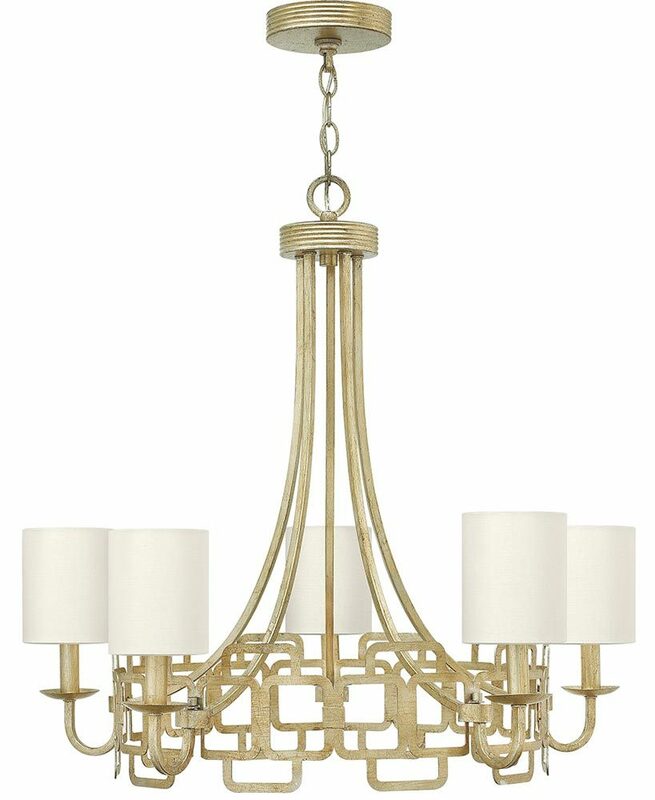 A delicately ribbed canopy and finial enhances its luxury feel. Supplied with 305cm of chain suspension that can be shortened at the time of installation to achieve your desired drop; please see the technical information below for details. 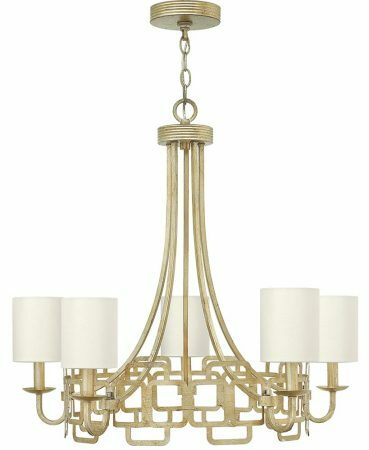 Give your home a contemporary flourish with this good sized chandelier. The intricate, complex design provides a warm, ambient light that plays through the surrounding shades while also shining bright light directly up and downwards. A brilliant luxurious addition to any dining room, living room, hallway or bedroom with sufficient ceiling height. There are matching fittings available in the Sabina collection that includes three and four-light pendants, a flush mount ceiling light and double wall light; please see below for the complete range. This luxury light is supplied by Elstead Lighting and designed in the USA by Hinkley, founded in 1922 in Cleveland, Ohio. They have transformed from a small outdoor lantern company to a global brand intent on bringing you the best in style, quality and value designs like the Sabina 5 light chandelier in silver leaf finish with eggshell silk shades featured here.